Download "POLICE SERGEANT. 6. Conduct a continuing review of assigned activities to identify problems and develop recommendations for improving services." 1 POLICE SERGEANT Class specifications are intended to present a descriptive list of the range of duties performed by employees in the class. Specifications are not intended to reflect all duties performed within the job. SUMMARY DESCRIPTION Under direction, plans, directs, supervises, assigns, reviews, and participates in the work of law enforcement staff involved in traffic and field patrol, investigations, crime prevention, community relations, and related services and activities; serves as watch commander on an assigned shift; oversees and participates in all work activities; assumes responsibility for assigned special programs, projects, or department-wide functions or activities; coordinates activities with other agencies; and performs a variety of administrative and technical tasks relative to assigned area of responsibility. REPRESENTATIVE DUTIES The following duties are typical for this classification. Incumbents may not perform all of the listed duties and/or may be required to perform additional or different duties from those set forth below to address business needs and changing business practices. 1. 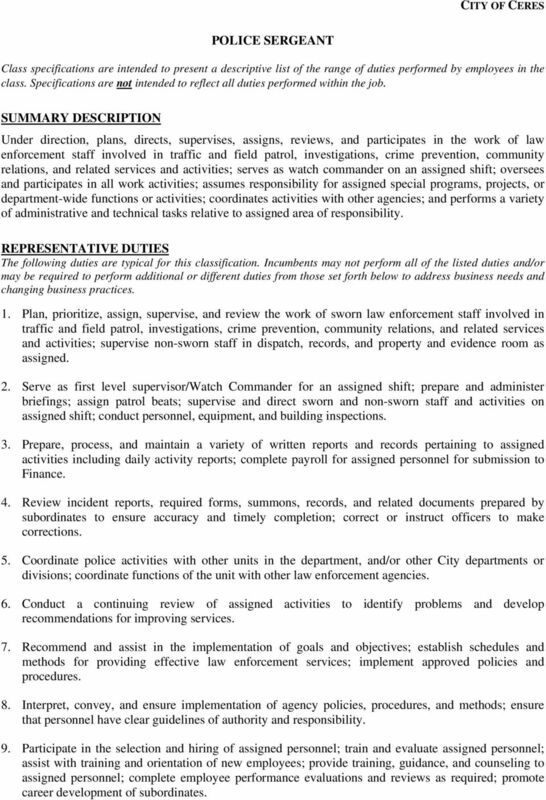 Plan, prioritize, assign, supervise, and review the work of sworn law enforcement staff involved in traffic and field patrol, investigations, crime prevention, community relations, and related services and activities; supervise non-sworn staff in dispatch, records, and property and evidence room as assigned. 2. Serve as first level supervisor/watch Commander for an assigned shift; prepare and administer briefings; assign patrol beats; supervise and direct sworn and non-sworn staff and activities on assigned shift; conduct personnel, equipment, and building inspections. 3. Prepare, process, and maintain a variety of written reports and records pertaining to assigned activities including daily activity reports; complete payroll for assigned personnel for submission to Finance. 4. Review incident reports, required forms, summons, records, and related documents prepared by subordinates to ensure accuracy and timely completion; correct or instruct officers to make corrections. 5. Coordinate police activities with other units in the department, and/or other City departments or divisions; coordinate functions of the unit with other law enforcement agencies. 6. Conduct a continuing review of assigned activities to identify problems and develop recommendations for improving services. 7. Recommend and assist in the implementation of goals and objectives; establish schedules and methods for providing effective law enforcement services; implement approved policies and procedures. 8. Interpret, convey, and ensure implementation of agency policies, procedures, and methods; ensure that personnel have clear guidelines of authority and responsibility. 9. Participate in the selection and hiring of assigned personnel; train and evaluate assigned personnel; assist with training and orientation of new employees; provide training, guidance, and counseling to assigned personnel; complete employee performance evaluations and reviews as required; promote career development of subordinates. 2 10. Respond to major crimes, accident scenes, and emergencies; assume initial command; establish field command posts and implement the Incident Command System; may act as incident commander until such time as a higher-ranking person assumes command. 11. Assume responsibility for assigned collateral functions including special programs, projects, or department-wide functions or activities; supervise specialized teams and services including Special Weapons and Tactics (SWAT), Hostage Negotiation Team (HNT), Field Training Officers, Vehicle Abatement Unit, Equestrian Unit, Canine Unit, and related assignments. 12. Provide a full range of administrative support to management staff; conduct a variety of organizational studies, investigations, and operational studies; recommend modifications to programs, policies, and procedures as appropriate; prepare departmental policies and procedures; prepare and present staff reports and other necessary correspondence. 13. Participate in budget development and administration; prepare and plan budget requests for assigned operations and special details; participate in the development of grant applications and the administration of grants. 14. Conduct internal affairs investigations and investigation of citizen complaints as necessary. 15. Participate in shift activities as necessary including enforcing local and state laws; issue citations and make arrests. 16. Speak before groups and represent the department and City at meetings and conferences. 17. Supervise and participate in the preparation of reports for various cases including cases going to trial; prepare supplemental reports as required; appear in court to present evidence and testimony as required. 18. When assigned to investigations, supervise and personally conduct complete and detailed investigations of a general and specialized nature; review all patrol generated reports and evaluate, prioritize, and assign them to detectives for follow-up investigations; manage day-to-day activities and coordinate investigations including those involving several officers, units and divisions; oversee and participate in undercover and surveillance operations; review all investigation reports and make recommendations and suggestions to officers; supervise and assist officers in follow-up investigations including the gathering of evidence, questioning of witnesses, and apprehension of suspects; oversee the Department s Concealed Weapon Permit program. 19. When assigned to traffic, supervise and participate in traffic control activities and accident investigations; review and correct all departmental traffic collision reports and towed vehicle reports; review and make decisions on request for early release of towed vehicles; respond to call outs on major injury or death accident investigations; respond to questions from citizens concerning traffic related issues. 20. When assigned as Administrative Sergeant, oversee and supervise a variety of special services, programs, projects, and units including the rotation towing program, volunteer program, reserve officer program, police chaplain program, juvenile diversion program, and School Resource Officer functions; issue bingo permits and other special permits for licensing; oversee the departments public relations function; oversee background investigations for new hires; coordinate special events; handle miscellaneous complaints and projects for the Chief s office. 21. Perform related duties as required. 3 QUALIFICATIONS The following generally describes the knowledge and ability required to enter the job and/or be learned within a short period of time in order to successfully perform the assigned duties. 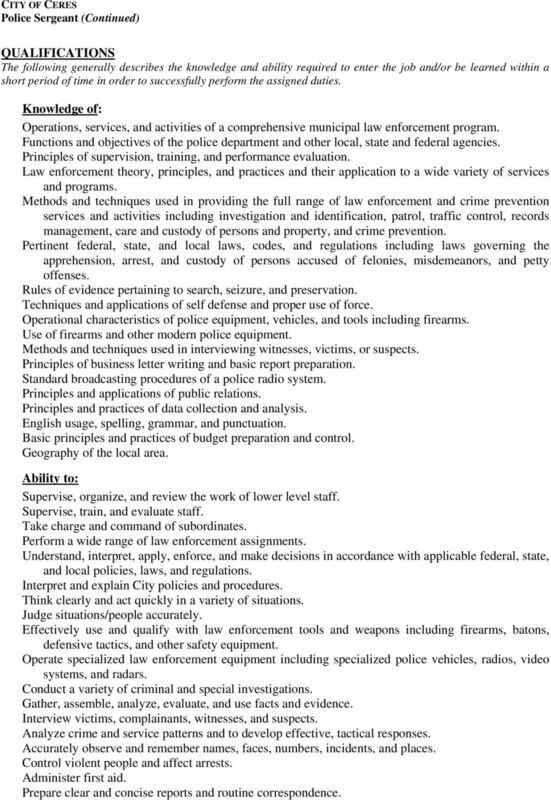 Knowledge of: Operations, services, and activities of a comprehensive municipal law enforcement program. 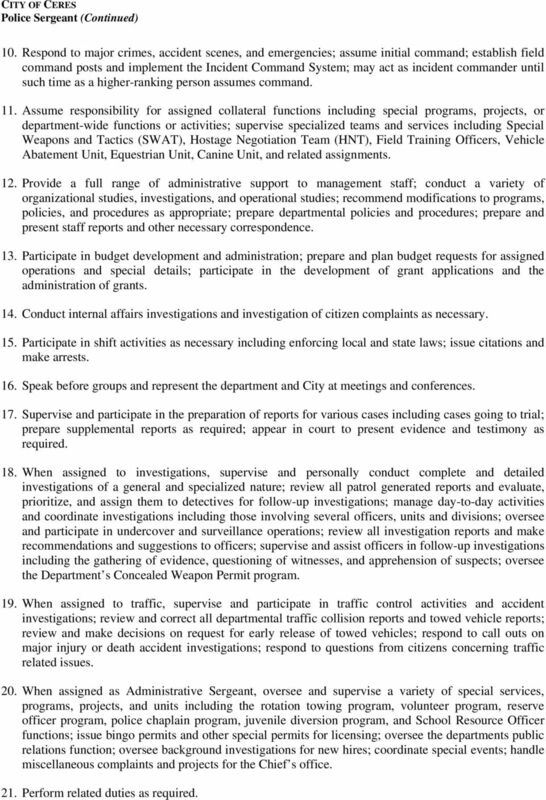 Functions and objectives of the police department and other local, state and federal agencies. Principles of supervision, training, and performance evaluation. Law enforcement theory, principles, and practices and their application to a wide variety of services and programs. Methods and techniques used in providing the full range of law enforcement and crime prevention services and activities including investigation and identification, patrol, traffic control, records management, care and custody of persons and property, and crime prevention. Pertinent federal, state, and local laws, codes, and regulations including laws governing the apprehension, arrest, and custody of persons accused of felonies, misdemeanors, and petty offenses. Rules of evidence pertaining to search, seizure, and preservation. Techniques and applications of self defense and proper use of force. Operational characteristics of police equipment, vehicles, and tools including firearms. Use of firearms and other modern police equipment. Methods and techniques used in interviewing witnesses, victims, or suspects. Principles of business letter writing and basic report preparation. Standard broadcasting procedures of a police radio system. Principles and applications of public relations. Principles and practices of data collection and analysis. English usage, spelling, grammar, and punctuation. Basic principles and practices of budget preparation and control. Geography of the local area. Ability to: Supervise, organize, and review the work of lower level staff. Supervise, train, and evaluate staff. Take charge and command of subordinates. Perform a wide range of law enforcement assignments. Understand, interpret, apply, enforce, and make decisions in accordance with applicable federal, state, and local policies, laws, and regulations. Interpret and explain City policies and procedures. Think clearly and act quickly in a variety of situations. Judge situations/people accurately. Effectively use and qualify with law enforcement tools and weapons including firearms, batons, defensive tactics, and other safety equipment. Operate specialized law enforcement equipment including specialized police vehicles, radios, video systems, and radars. Conduct a variety of criminal and special investigations. Gather, assemble, analyze, evaluate, and use facts and evidence. Interview victims, complainants, witnesses, and suspects. Analyze crime and service patterns and to develop effective, tactical responses. Accurately observe and remember names, faces, numbers, incidents, and places. Control violent people and affect arrests. Administer first aid. Prepare clear and concise reports and routine correspondence. 5 use of computer keyboard; requires a sense of touch, finger dexterity, and gripping with hands and fingers; ability to speak and hear to exchange information; ability to operate a vehicle to travel to various locations; ability to operate and use specialized law enforcement tools and equipment including guns and handcuffs. Vision: See in the normal visual range with or without correction. Hearing: Hear in the normal audio range with or without correction. 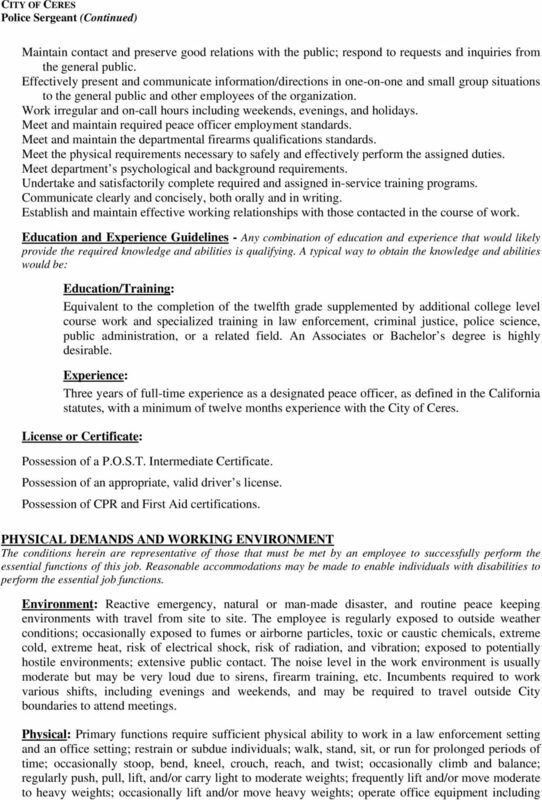 Bargaining Group: Ceres Police Officers Association FLSA Status: Non-Exempt June, 2007 Johnson & Associates ACKNOWLEDGMENT I acknowledge that I have read the job description and requirements for the Police Sergeant position and I certify that I can perform these functions. 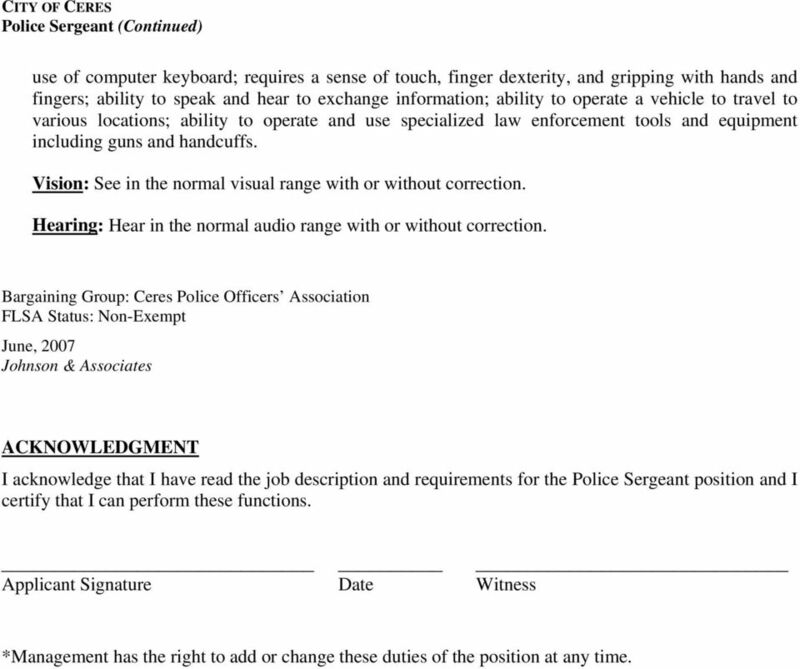 Applicant Signature Date Witness *Management has the right to add or change these duties of the position at any time.